Both the E32 and the E38 7-Series can suffer from the dreaded 'shimmy'. This is wheel-wobble that usually first shows itself under braking, for instance, when coming off a motorway intersection and braking from high speed. The wobble can be felt through the steering-wheel but it usually disappears as the car speed reduces. Sometimes this is all you ever get, but more usually you will start to get wobble as the car is accelerated through 50 - 60MPH. The more you drive the car the worse it will get. The wobble is quite often accompanied by tram lining and a general feeling of imprecision from the steering in general. 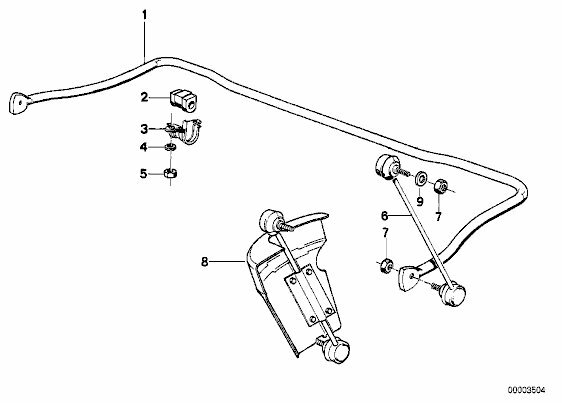 The shimmies are often an indication of general wear in the steering system and suspension, the BMW E32 has a great deal of weight over the front wheels, especially when braking. It also seems to have a resonant frequency that occurs between 50 and 60 MPH, if there is any weakness it is at this speed where the problems will occur. Let's first get rid of the wheel-wobble that isn't shimmy. If you get a wheel-wobble that really feels as if the wheel is coming loose and gets worse when the brakes are used then the first thing to suspect is a sticky brake calliper. The difference between shimmy and the wobble caused by a sticking brake calliper is that latter causes a massive wobble, the steering wheel is difficult to keep hold of and the wobble keeps going when you slow down, almost to a standstill. Vibration that only shows itself when giving the car some welly, especially in 2nd and 3rd gear is quite often due to the propshaft centre bearing. The bearing is held in a rubber-enclosed housing. When the bearing starts to fail the rubber soon deteriorates and this allows the propshaft too much lateral movement. 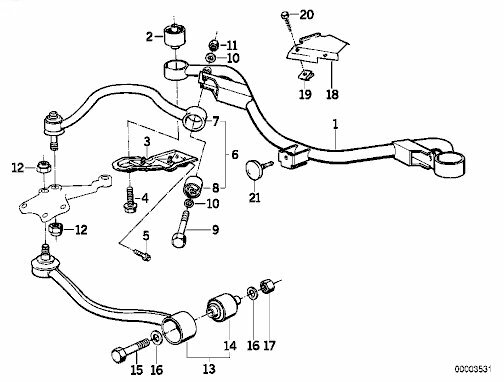 The movement causes a vibration through the car, it will eventually get to a point where the propshaft will start thumping the transmission tunnel. This type of problem always goes away when the throttle is lifted whereas shimmy doesn't. If you get a wobble that is only noticeable in 5th gear when you have your foot on the throttle it is almost always due to a single-cylinder failure on the engine. The lack of a single cylinder on a V8 is not that easy to spot, the power is a bit down and the tick-over is a bit lumpy but V8's are prone to that anyway. It is most noticeable when on the flat at about 70 MPH when accelerating. The wobble goes immediately the throttle is lifted. A check of the sparkplugs will show 7 white plugs and one oily one! I have had this fault on my E32 and the repair is covered here. 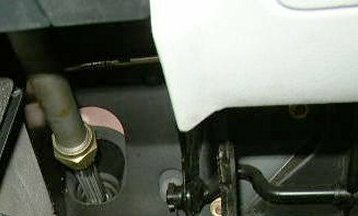 If you have fitted an alloy from a model with a different centre bore then you must fit spigot-rings. The only problem is that spigot-rings are not normally high-precision parts, they wear and corrode and when they do they will not hold the wheel central to the hub. If you are using spigot-rings consider getting alloys with the correct offset and bore, or, at the very least get new spigot rings. Even if you are using standard wheels or are using wheels with the correct bore and offset it is worth cleaning the bore and mating surfaces on both the inside of the wheel and the hub. Where there is corrosion on the hub or wheel the wheel will not mate correctly with the hub. Replica alloys usually have a 74.1mm bore and require hub-centric rings, if you have fitted replica alloys ensure these are fitted. Without the correct rings you will never get rid of wobbles and shimmies for any length of time. Click here for more information on fitting replica alloys. Cheap tyres are often a cause of problems, although these balance fine at low speeds, once they are taking the load of the car and are rotating at speed they do not retain their shape or were not round in the first place. There is only so much that sticking lead weights on the rim can compensate for. If you have a lot of lead on your wheels then something is not right in the first place. If you do not have staggered wheels fitted it is well worth rotating the wheels from the back to the front of the car to see if there is any difference. If it makes a big difference it is probably a problem with the tyres. Tighten the nut as much as possible, some have adjusted this to the point that the column does not telescope any more (putting the column in the preferred setting beforehand). As I say, this sometimes works but is a bit of a long shot. 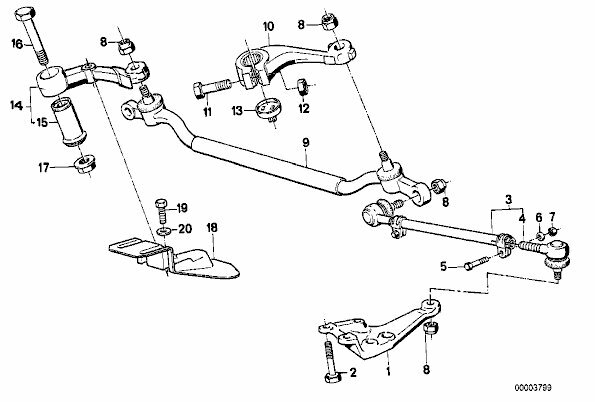 While you are at it you might as well replace the lower arms as well (item 13), the cost is not all that high and is worth doing once the car is on the lift. A big difference can be made by just changing the bushes (items 14 and 8) but normally if the bushes are damaged then the ball-joints are damaged at the same time. Some like to replace the bushes with polyurethane after-market versions, be aware though that this will significantly affect the quality of the suspension and may well lead to other component failures. Once you have got to this point things have got pretty expensive. You can get complete suspension refurbishment kits from Ebay.de, I have never tried these but have heard good things about them. The last two diagrams only represent 5% of the causes of shimmy so hopefully you will not need to get to this stage. Unfortunately, if you have just bought an E32 that has shimmy you will not be aware of what has been changed already. My best advice is don't buy an E32 with shimmy, it can be simple to fix, but it can also be expensive!